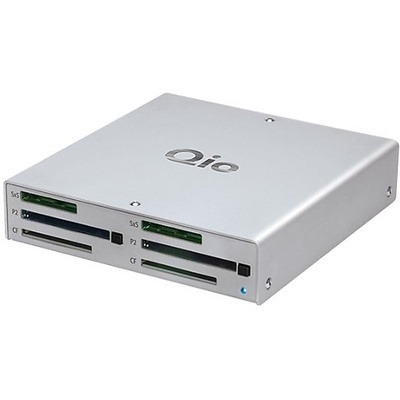 Product #16175 | SKU QIO-TB | 0.0 (no ratings yet) Thanks for your rating! The Qio High-Speed Universal Card Reader from Sonnet features native support for Sony SxS, Panasonic P2, and CompactFlash memory cards, and includes an adapter for SD/SDHC/SDXC cards. Additionally, it will accept XQD cards via an optional adapter. It is configured with a fast PCIe interface and is capable of maximum read speeds of 200MB/s. It also has 4 eSATA ports and comes with a Thunderbolt interface adapter and cable for connection and fast data transfer to a computer. Included is a universal AC power supply with wall plugs for the US, Japan, Europe, UK and Australia. Alternatively, an optional XLR 4-pin adapter cable can route battery power to the Qio. The card reader is constructed from aluminum and has a slot for Kensington and similar anti-theft locks. It is compatible with both Mac and Windows computers and also has Flash-ROM that is upgradeable to the latest firmware version.